The sky doesn’t become instantly dark when the sun sets in the evening. Sunlight is scattered by our atmosphere into the dark shadow of the earth. The part of the Moon’s shadow where the sun is completely hidden is called the umbra. The larger the umbra and the closer you are to its center, the deeper the shadow. Scattered light has to travel further to reach you. Why are some eclipses darker than others? The Moon has an elliptical orbit around the earth. Sometimes it is a bit closer or farther away than others. The closer the Moon is to the earth, the larger the umbra and the deeper the darkness is near the center of the umbra. The umbra is also larger when the eclipse occurs low in the sky. It falls obliquely on the earth, making it larger. Particulate pollution in the air can scatter more light and reduce the darkness of a total eclipse. All three of these things conspired to make the 2017 American eclipse not as dark as some. The Moon was a bit further from the earth than in many eclipses making the umbra smaller and the maximum duration of totality just over 2 and a half minutes. Some eclipses with larger umbras can last as long as 7 minutes causing a darker sky. The eclipse was high in the sky keeping the shadow close to it’s minimum size. Forrest fires in California and the Pacific Northwest put a considerable amount of ash into the air over much of the US adding to the scattered light. In any eclipse, being on the center line of the umbra will make the eclipse darker. 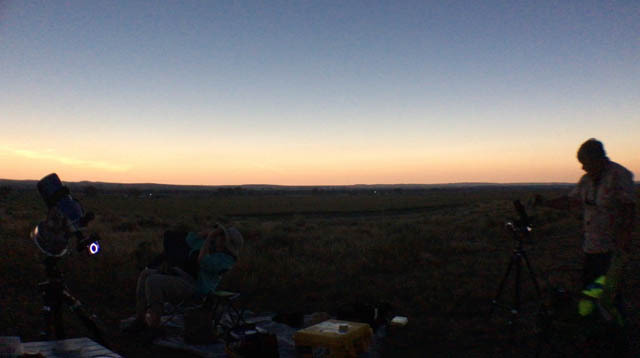 Here is what it looked like off the center line in Wyoming with a duration of 2 minutes 2 seconds. The sky was the color of twilight and not the black of night. The brightest thing in the image is the Sun’s corona on the camera display.